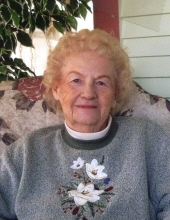 Evelyn Virginia Denekas, 96, formerly of Jewell passed away peacefully in the presence of her daughters on Sunday, April 7, 2019 at the VanDiest Medical Center in Webster City. Funeral services will be Thursday, April 11 at 1:30 at Soderstrum-Reimers Funeral Home in Jewell. Burial will follow in the Evergreen Cemetery in Jewell. Visitation will be an hour prior to the service. Evelyn was born July 19, 1922 on a farm north of Ellsworth to Clarence and Dora Roe. She was the second of five children. Evelyn was born in the same house her father was born in. As a child, she attended the Rose Grove Lutheran Church where her grandfather was the song leader for many years. Evelyn later became a member of Bethesda Lutheran Church in Jewell. She was united to marriage to Leo Denekas on September 15, 1942 in Bethany, Missouri. They were married for 65 years. Evelyn is survived by he daughters, Linda Keigan of Webster City and Marsha (Ronald) Foderberg of Ames; five grandchildren, Ronda Croft (Doyle Frye) of Ankeny, Laurie Foderberg (Kevin Mount) of Cambridge, Sara Arriaga (Adan) of Cambridge, Mark Keigan and James Keigan of Webster City; three great grandchildren, Gavin, Alba and Luca Dominguez; a sister, Marjorie Chirsteanson and a brother, Marvin Roe. Evelyn was preceded in death by her parents; husband Leo; son Gary in 1967; a granddaughter in 1971 and two sisters, Arlene Weidner and Dorothy Seaman. To send flowers or a remembrance gift to the family of Evelyn Virginia Denekas, please visit our Tribute Store. "Email Address" would like to share the life celebration of Evelyn Virginia Denekas. Click on the "link" to go to share a favorite memory or leave a condolence message for the family.